This is my review of Ex_Machina! When a young coder named Caleb (Domhall Gleeson) wins at raffle because–potatoes!–at the Google-esque company where he works, he gets to spend one week with Nathan (Oscar Isaac), the eccentric CEO of the company. Nathan reveals to Caleb his latest creation: A humanoid cyborg named Ava (Alicia Vikander). Nathan assigns Caleb to conduct a series of interviews with Ava and apply the Turing Test; to put it simply, he has to measure Ava’s ability to persuade him that she is human even though she is actually AI (Artificial Intelligence). So I watched this movie on my lunch break and was almost late getting back to work because this is an intelligent and engrossing film. Move over, Fantastic Chore–I mean Bore–I mean Four; THIS is the sci-fi film of the year! I can’t wait to see Oscar Isaac in Star Wars: The Force Awakens because he is fantastic as Nathan. He brings to life a secluded genius who feels a need to mentor and guide others as a way to overcompensate for the fact that he fails to connect with others on a daily basis. 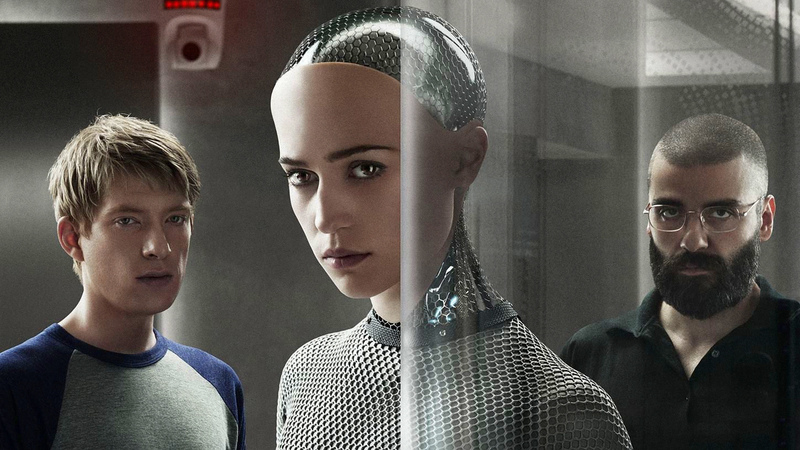 Alicia Vikander gives one of the best performances as a robotic protagonist I’ve seen in a while. Her voice is low-key and slightly monotone, hence reminding us that she is a cyborg, but her movements, facial expressions and careful changing of voice pitch makes her a convincing human. Caleb starts out as a blank slate, but slowly evolves into a distrusting man who ends up questioning his own humanity in one particular scene where [SPOILER] he cuts himself with a razor to see if he is all wires or water and bone. Self-injury is tough to do in cinema without looking exploitive, but this scene was well handled and served a purpose to his character development. I want the soundtrack for this movie because the music matches the cool, low-lit atmosphere of Nathan’s research facility. The eerie soundtrack has that “someone is watching you from a dark corner” kind of vibe that a clausterphobic sci-fi film needs. A while ago, Father Robert Barron posted a video called “Planned Parenthood and the Loss of Human Dignity.” In it, he mentioned how when the value of human life is not determined by God, but rather by who society says has the right to life, the loss of human dignity is sure to follow. Anyway, I bring this up because there are quite a few times where I felt that some pro-life thinking worked its way into the script. Father Barron said that there is dangers to letting sentimentality (our feelings towards others) or productivity (someone’s usefulness in society) be a determining factor in who is deserving of human dignity and who is not. I didn’t feel that Nathan’s assignment to Caleb was explained very well. By that, I mean Nathan explains it with too much techno-babble instead of keeping the explanation plain and simple. Any time you write a story that is essentially a think-piece, you run the risk of the ideas trying to be the story instead of the story having ideas. Old Fashioned had this problem, and Ex_Machina faces this roadblock, as well. Honestly I don’t think there’s a perfect solution for this issue in think-piece stories, but being aware of it would be helpful to aspiring filmmakers who want to make their audience ponder new ideas. Overall Ex_Machina is a top-notch film from a first-time director. An engaging script with thoughtful performances and great musical score make this worth all the praise and accolades it has received.